I will say up front that if you find it a little strange that there’s an aquarium over 1000 miles from the nearest major body of water, you aren’t alone. My friend and I were certainly curious about what kind of aquatic life we might find. Perhaps it’s because I’ve been spoiled by growing up on the coast. Not only “the coast”: I have great memories of seeing amazing things in the incredible Chesapeake Bay ecosystem. We had awesome field trips out on research boats, and between school and my family, I enjoyed visits to the Virginia Marine Science Museum, National Aquarium (formerly the Baltimore Aquarium), and the North Carolina state aquariums. More recently I’ve been to the Aquarium of the Pacific in Long Beach, California and Sea World in Florida (which has great conservation and education programs, despite the 2013 release of Blackfish). Having visiting some of the most amazing aquariums in the country, I walked into the Denver Downtown Aquarium a bit more skeptical than most, I’m sure. Most museums and educational centers these day want to focus on local ecology, so I was expecting something like the aquarium tanks at our local Cabela’s and Bass Pro Shops. And there was plenty of that. It’s a commercially-owned attraction — purchased by Landry’s Restaurants in 2003 — and there was so much money-making going on during our experience. And much more…strangeness. 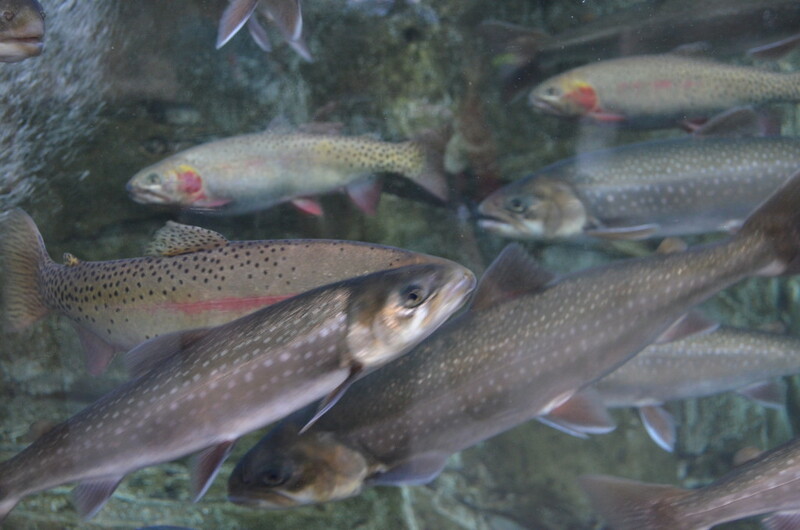 The green cutthroat trout is Colorado’s state fish. Read more about it here. Guests to the aquarium will start with several tanks of “local” aquatic wildlife. They’re fun to look at, but I’m always thinking about how many of these fish taste sauteed in butter. There are over 20 tanks like this and it was quite crowded to get close enough to take many picture. The fish were swimming around excitedly and it was tricky to get still photos too. 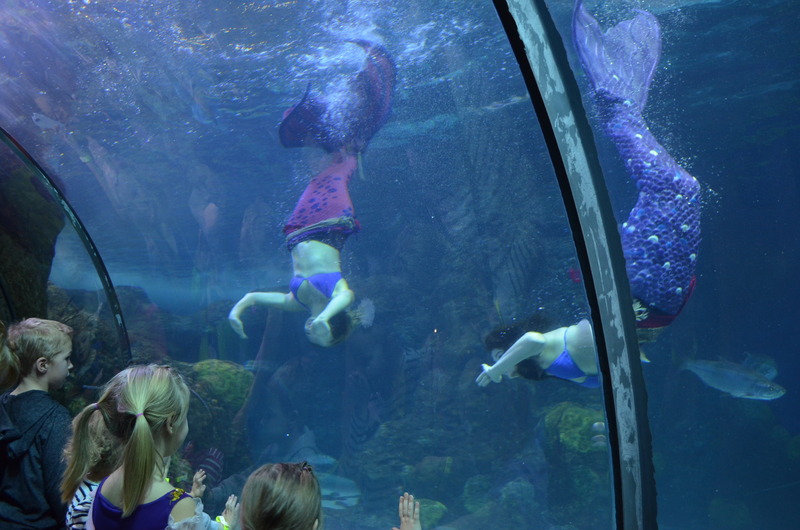 After the river/lake tanks, you start to get into the oceanic aquatic wildlife tanks…and the mermaids. Yep. 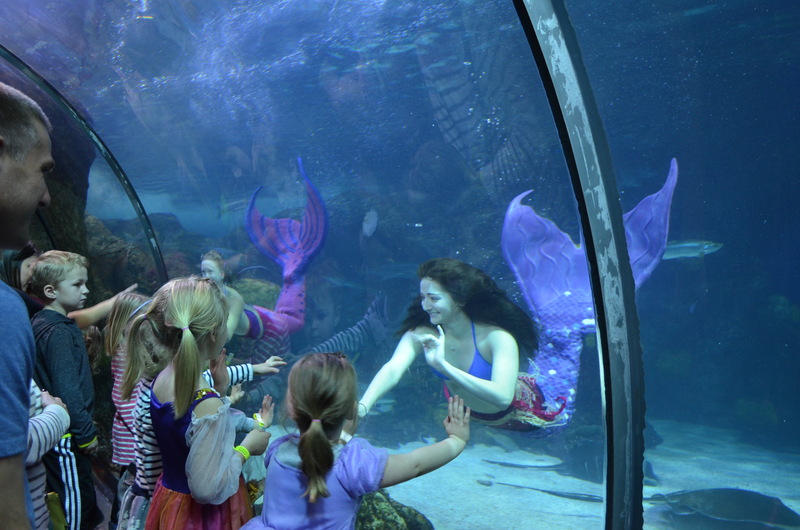 There’s a mermaid program at the Downtown Aquarium. They perform in one of the oceanic tanks several times per day, discussing the wildlife in the tank, and how we humans can be good stewards of our environment and waterways. We were walking past the tank with the mermaid show as it had started, so we tried to catch a glimpse. I was unable to, but I think a couple of the kids with us could. After the show the mermaids did flips and posed with the kids. Our boys weren’t interested, but the little girls visiting the aquarium were certainly giving them the rock star treatment. Mermaids doing flips. I’m sure it’s no coincidence that most of them I saw (I saw four total during our visit) had red hair? This was in the rain forecast area of the aquarium. It was SO LOUD. I didn’t take any pictures, but here’s a You Tube video someone else took several years ago. It just seems very strange to have this at an aquarium…that’s all I’ll say about that. The Downtown Aquarium has a tiger exhibit. It’s quite large, and there are four Sumatran tigers who live in the large enclosure smack dab in the middle of the Downtown Aquarium! My girlfriend and I had the same thought, “I thought this was an aquarium!” I applaud their conservation efforts, and I’m surprised other facilities couldn’t take them in. 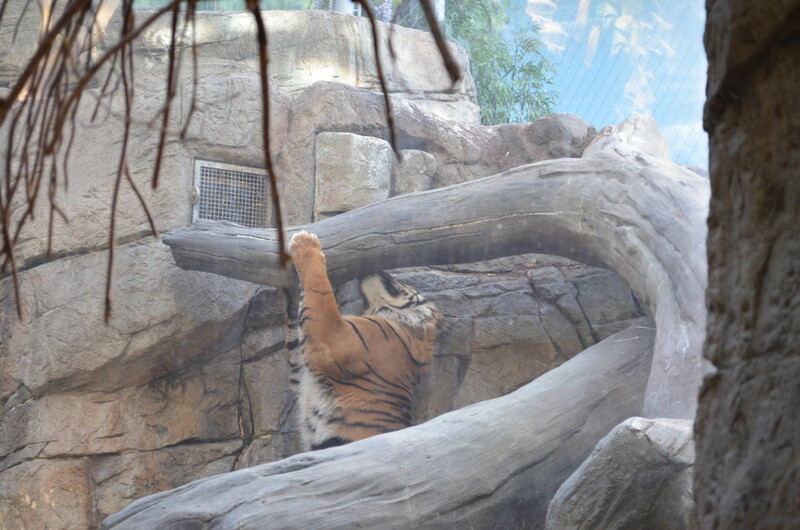 This tiger really liked petting that large wood branch over his head. …looked like a carnival area. The picture I took didn’t turn out very well at all. 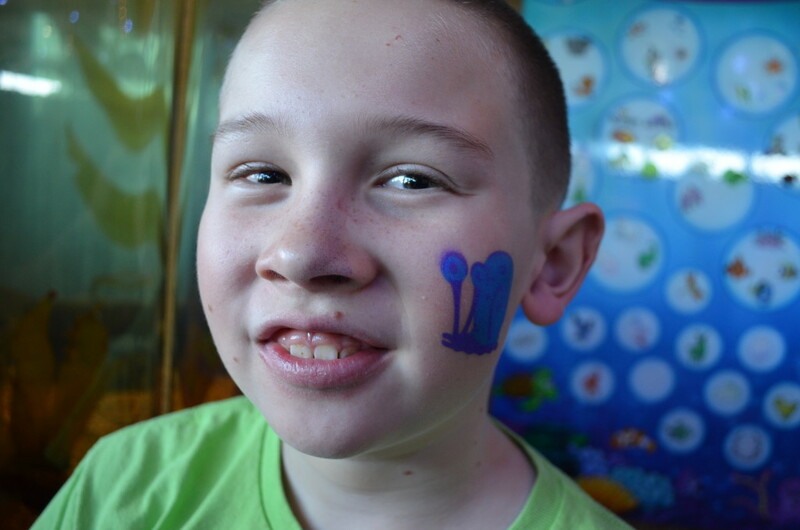 There were numerous activities for the kids to do (and for the parents to spend money on): feeding stingrays, painting faces, climbing a fake coconut tree, and experiencing a real live hurricane! This was all I could muster for spending money at the end of the exhibits, between the crowds and the practicality of what we could get. 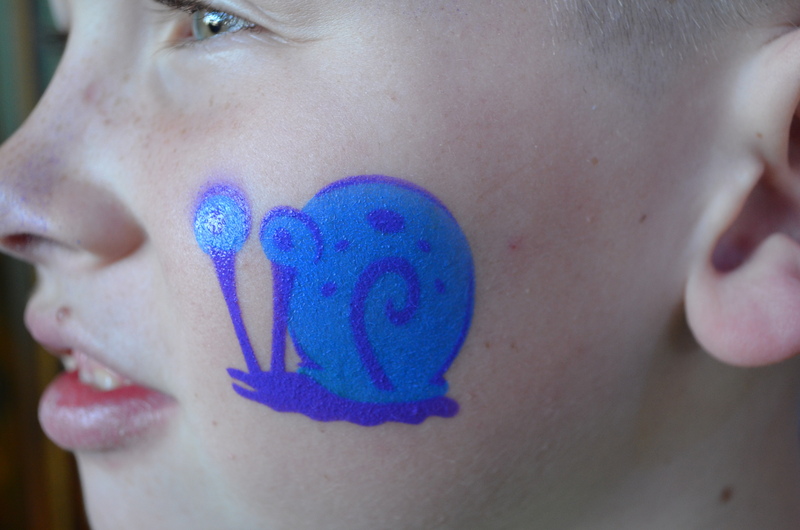 It’s Gary the Snail from Spongebob. We spent about two hours at the museum, and had plenty of time to arrange our next event, a tour of Sports Authority Field and a nice Southern-style lunch in between. Admission ranges from $18 for adults to $12 for children. There is a multitude of add-ons to the tickets, from the ICE AGE 4D movie to the carousel to the aquarium train. Military families can get discount tickets for $14 for adults and $7.50 for kids. It’s a fun family friendly activity if you have an available day of sightseeing in Denver.